^ a b Tambussi, C.; Ubilla, M.; Perea, D. (1999). “The youngest large carnassial bird (Phorusrhacidae, Phorusrhacinae) from South America (Pliocene–Early Pleistocene of Uruguay)”. Journal of Vertebrate Paleontology 19 (2): 404–406. doi:10.1080/02724634.1999.10011154. ^ Ameghino, F (1889). “Contribuición al conocimiento de los mamíferos fósiles de la República Argentina” (Spanish). Actas Academia Nacional Ciencias de Córdoba 6: 1–1028. ^ Blanco, R. E.; Jones, W. W. (2005). “Terror birds on the run: a mechanical model to estimate its maximum running speed”. Proceedings of the Royal Society B 272 (1574): 1769–1773. doi:10.1098/rspb.2005.3133. PMC: 1559870. PMID 16096087. http://rspb.royalsocietypublishing.org/content/272/1574/1769.full.pdf. ^ a b Woodburne, M. O. (2010-07-14). “The Great American Biotic Interchange: Dispersals, Tectonics, Climate, Sea Level and Holding Pens”. Journal of Mammalian Evolution 17 (4): 245–264. doi:10.1007/s10914-010-9144-8. PMC: 2987556. PMID 21125025. https://www.ncbi.nlm.nih.gov/pmc/articles/PMC2987556/. ^ MacFadden, Bruce J.; Labs-Hochstein, Joann; Hulbert, Richard C.; Baskin, Jon A. (2007). “Revised age of the late Neogene terror bird (Titanis) in North America during the Great American Interchange”. Geology 35 (2): 123–126. doi:10.1130/G23186A.1. ^ Alvarenga, H.; Jones, W.; Rinderknecht, A. (2010). “The youngest record of phorusrhacid birds (Aves, Phorusrhacidae) from the late Pleistocene of Uruguay”. Neues Jahrbuch für Geologie und Paläontologie - Abhandlungen 256 (2): 229–234. doi:10.1127/0077-7749/2010/0052. http://www.museuhistorianatural.com/pesquisa_arquivos/2010/Phorusrh._Pleist.sup.Alvarenga.pdf. ^ a b Jones, W.; Rinderknecht, A.; Alvarenga, H.; Montenegro, F.; Ubilla, M. (2017). “The last terror birds (Aves, Phorusrhacidae): new evidence from the late Pleistocene of Uruguay”. Paläontologische Zeitschrift 92 (2): 365–372. doi:10.1007/s12542-017-0388-y. ^ Agnolin, F. (2013). La posición sistemática de Hermosiornis (Aves, Phororhacoidea) y sus implicancias filogenéticas. Revista del Museo Argentino de Ciencias Naturales nueva serie, 15(1), 39-60. ^ Delphine Angst et al. (2013) A Large Phorusrhacid Bird From the Middle Eocene of France. ^ a b c Angst, D.; Buffetaut, E.; Lécuyer, C.; Amiot, R. (2013). “"Terror Birds" (Phorusrhacidae) from the Eocene of Europe Imply Trans-Tethys Dispersal”. PLOS One 8 (11): e80357. doi:10.1371/journal.pone.0080357. PMC: 3842325. PMID 24312212. https://www.ncbi.nlm.nih.gov/pmc/articles/PMC3842325/. ^ Benton, R. C.; Terry, D. O., Jr.; Evanoff, E.; McDonald, H. G. (25 May 2015). The White River Badlands: Geology and Paleontology. Indiana University Press. p. 95. ISBN 978-0253016089. https://books.google.com/books?id=ZcFtCQAAQBAJ&pg=PA95. ^ a b Cracraft, J. (1968). “A review of the Bathornithidae (Aves, Gruiformes), with remarks on the relationships of the suborder Cariamae”. American Museum Novitates 2326: 1–46. http://digitallibrary.amnh.org/handle/2246/2536 2018年5月26日閲覧。. ^ Federico L. Agnolin (2009). "Sistemática y Filogenia de las Aves Fororracoideas (Gruiformes, Cariamae)" (PDF). Fundación de Historia Natural Felix de Azara: 1–79. ^ Mayr, G.; Noriega, J. (2013). “A well-preserved partial skeleton of the poorly known early Miocene seriema Noriegavis santacrucensis (Aves, Cariamidae)”. Acta Palaeontologica Polonica. doi:10.4202/app.00011.2013. ^ Tambussi, CP; de Mendoza, R; Degrange, FJ; Picasso, MB. (2013). “Flexibility along the Neck of the Neogene Terror Bird Andalgalornis steulleti (Aves Phorusrhacidae)”. PLOS One 7 (5): e37701. doi:10.1371/journal.pone.0037701. PMC: 3360764. PMID 22662194. https://www.ncbi.nlm.nih.gov/pmc/articles/PMC3360764/. ^ Bertelli, Sara; Chiappe, Luis M; Tambussi, Claudia (2007). “A New Phorusrhacid (Aves: Cariamae) from the Middle Miocene of Patagonia, Argentina”. Journal of Vertebrate Paleontology 27 (2): 409–419. doi:[[doi:10.1671%2F0272-4634%282007%2927%5B409%3AANPACF%5D2.0.CO%3B2|10.1671/0272-4634(2007)27[409:ANPACF]2.0.CO;2]]. ^ Antón, Mauricio (2013). Sabertooth. Bloomington, Indiana: University of Indiana Press. p. 61. ISBN 9780253010421. ^ Bakker, Robert (1998). “Brontosaur Killers: Late Jurassic Allosaurids as Sabre-tooth Cat Analogues”. GAIA 15 (8): 145–158. https://www.researchgate.net/publication/40662858. ^ Wroe, Stephen (2010). “Mechanical Analysis Of Feeding Behavior In The Extinct "Terror Bird' Andalgalornis steulleti (Gruiformes: Phorusrhacidae)”. PLOS One 5 (8): 1–7. doi:10.1371/journal.pone.0011856. PMID 20805872. ^ King, James L. Semicircular canal shape within Aves and non-avian Theropoda: Utilizing geometric morphometrics to correlate life history with canal cross-sectional shape. ^ "Ancient "terror Bird" Used Powerful Beak to Jab like an Agile Boxer." OHIO: Research. Ohio Office of Research Communications, 18 Aug. 2010. Web. 24 Oct. 2013. http://www.ohio.edu/research/communications/terrorbirds.cfm. ^ Webb, S. David (23 August 2006). “The Great American Biotic Interchange: Patterns and Processes”. Annals of the Missouri Botanical Garden 93 (2): 245–257. doi:[[doi:10.3417%2F0026-6493%282006%2993%5B245%3ATGABIP%5D2.0.CO%3B2|10.3417/0026-6493(2006)93[245:TGABIP]2.0.CO;2]]. ^ Marshall, Larry G. "The Terror Birds of South America." Scientific American Special Edition. N.p., n.d. Web. 24 Oct. 2013. http://usuarios.geofisica.unam.mx/cecilia/cursos/TerrorBirds-Marshall94.pdf. ^ Gasparini, Zulma (September 1984). “New Tertiary Sebecosuchia (Crocodylia: Mesosuchia) from Argentina”. Journal of Vertebrate Paleontology 4 (1): 85–95. doi:10.1080/02724634.1984.10011988. JSTOR 4522967. ^ Prevosti, Francisco J; Forasiepi, Analía; Zimicz, Natalia (2013). “The Evolution Of The Cenozoic Terrestrial Mammalian Predator Guild In South America: Competition Or Replacement?”. Journal of Mammalian Evolution 20 (1): 3–21. doi:10.1007/s10914-011-9175-9. ^ a b c Chiappe, Luis M.Bertelli; Sara (2006). 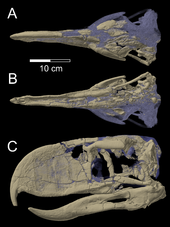 “Palaeontology: Skull Morphology Of Giant Terror Birds”. Nature 443 (7114): 929. doi:10.1038/443929a. PMID 17066027. ^ Alvarenga, Herculano M.F. ; Höfling, Elizabeth (2003). “Systematic revision of the Phorusrhacidae (Aves: Ralliformes)”. Papéis Avulsos de Zoologia 43 (4): 55–91. doi:10.1590/S0031-10492003000400001. http://www.scielo.br/scielo.php?script=sci_pdf&pid=S0031-10492003000400001&lng=en&nrm=iso&tlng=en. ^ Cenizo, Marcos M. (2012). “Review Of The Putative Phorusrhacidae From The Cretaceous And Paleogene Of Antarctica: New Records Of Ratites And Pelagornithid Birds”. Polish Polar Research 33 (3): 239–258. doi:10.2478/v10183-012-0014-3. ^ Federico L. Agnolin & Pablo Chafrat (2015). “New fossil bird remains from the Chichinales Formation (Early Miocene) of northern Patagonia, Argentina”. Annales de Paléontologie 101 (2): 87–94. doi:10.1016/j.annpal.2015.02.001. ^ Alvarenga, HMF; Höfling, E (2003). “Systematic revision of the Phorusrhacidae (Aves: Ralliformes)”. Papéis Avulsos de Zoologia 43 (4): 55–91. doi:10.1590/s0031-10492003000400001. ^ Federico J. Degrange; Claudia P. Tambussi; Matías L. Taglioretti; Alejandro Dondas; Fernando Scaglia (2015). “A new Mesembriornithinae (Aves, Phorusrhacidae) provides new insights into the phylogeny and sensory capabilities of terror birds”. Journal of Vertebrate Paleontology Online edition (2): e912656. doi:10.1080/02724634.2014.912656. ^ Mayr, Gerald (2005-04-15). “Old World phorusrhacids (Aves, Phorusrhacidae): a new look at Strigogyps ("Aenigmavis") sapea (Peters 1987)” (abstract). PaleoBios 25 (1): 11–16. http://www.ucmp.berkeley.edu/science/paleobios/abstracts_21to25.php 2008年7月4日閲覧。. ^ Hackett, Shannon J. (2008-06-27). “A Phylogenomic Study of Birds Reveals Their Evolutionary History”. Science 320 (5884): 1763–1768. doi:10.1126/science.1157704. PMID 18583609. http://www.sciencemag.org/cgi/content/abstract/320/5884/1763 2008年10月18日閲覧。. ^ Alexander Suh (2011-08-23). “Mesozoic retroposons reveal parrots as the closest living relatives of passerine birds”. Nature Communications 2 (8): 443. doi:10.1038/ncomms1448. PMC: 3265382. PMID 21863010. http://www.nature.com/ncomms/journal/v2/n8/full/ncomms1448.html. ^ Jarvis, E. D.; Mirarab, S.; Aberer, A. J.; Li, B.; Houde, P.; Li, C.; Ho, S. Y. W.; Faircloth, B. C. et al. (2014). “Whole-genome analyses resolve early branches in the tree of life of modern birds”. Science 346 (6215): 1320–1331. doi:10.1126/science.1253451. PMC: 4405904. PMID 25504713. https://pgl.soe.ucsc.edu/jarvis14.pdf.